Most people are intimidated by chocolate (working with it or in tasting fine chocolate). Satisfying chocolate is not reserved for the snobs or foodie elitists. No. Quality chocolate is for all to enjoy, no matter your expertise. We are all capable of learning. There is a wealth of research and information which never reaches the public. Information which will help all of us become more informed, smarter, and especially more satisfied consumers of chocolate. It takes a village to uphold quality. The better you are at discerning quality, the more power you have in encouraging the makers, farmers, and researchers who you want to see succeed. Geoseph grew up in the Italian community of Woodbridge, Ontario, where quality craftsmanship, Southern Italian food, and the spirit of sharing surrounded him. From this grew his belief that chocolate should unite beautiful flavour with skillful craftsmanship; something worth sharing. His lifelong passions of animals, art, and food steered him to study Biology, Zoology, and Fine Arts at the University of Toronto, where he received his Bachelor of Science. Upon graduating, his passion for food drew him toward George Brown College, where he honed in on his skills in the Pastry Arts Program. It was here where he came across a job posting for a chocolate sommelier, and after taking on the position in 2008, he has been forever dedicated to chocolate. For over a decade, he has worked for top and internationally acclaimed chocolateries, winning national and international awards for his chocolates he designed and created. He’s left a legacy of passion and inspiration wherever he has worked including Toronto, Vancouver, & New Zealand. He has developed his own chocolate education curriculum, professional level workshops, and bean to bar club, all built upon the research he sources himself. 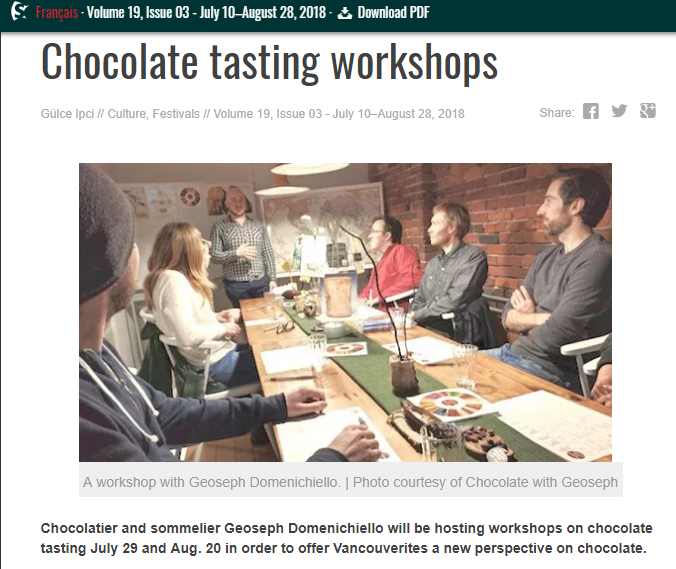 Geoseph works in Vancouver as a chocolatier & chocolate educator, conducting workshops, classes, and hosting the Vancouver Chocolate Social Club. Outside this realm, his time revolves around paddleboarding, and plenty of reading. This multipotentialite has also worked in the balloon industry, herpetology, crisis counselling, and even in a guppy behaviour lab. Life is about experience. We all share the ability to sense flavour, but our experience is our own. It is unique to us based on how we receive flavour information, and how our brain processes this information. + Are you or this website affiliated with any organization? I am not. I am an independent researcher and chocolate educator, learning and teaching since 2008. I have a passion for science, knowledge, and chocolate, and combine these together to offer you an honest look into the world of chocolate. I have nothing against many chocolate or cocoa related organizations, but I'm not working with them. As well, the website is not affiliated with any organization, business, or person other than myself. I am grateful for the hard work others have done that allow me to put this site together, and you can find links to some of that in the resources or blog sections. + What is the purpose of this website? To educate you about fine chocolate, bean to bar, and help you heighten your satisfaction and guide you toward quality chocolate and quality people within the industry. Many talented and skilful chocolate makers and chocolatiers are overlooked due to the fact that their energy is focused on quality, transparency, and fairness to those in the industry. Putting your trust in labels, marketing, and certifications often directs you away from those who care more about the integrity of chocolate than their image or bank accounts. The truth is, once you understand quality, and have the tools necessary, you'll begin to enjoy chocolate more than you've ever expected. You'll be more satisfied with your choices, and your choices will encourage skillful and honest craftsmanship. I'm a professional chocolatier and chocolate sommelier creating and educating for over a decade. I obtained my BSc from the University of Toronto, and received college level training within the realm of pastry and teaching. What sets me apart from most chocolate sommeliers is that I pursue my own research revolving around the science, history, and manufacturing of chocolate. I delve into research based books, published research articles from scientific journals, and corresponding with researchers and chocolate makers directly. Going to the source of the information is the only way to be objective, confident, and relevant within the industry. There really isn't any one body that governs credentials for a chocolate sommelier at this point. Currently, anyone who trains or educates others to be chocolate sommeliers or connoisseurs are self taught themselves (with varying levels of skills and expertise). Chocolate sommeliers who base their knowledge on primary research (scientific articles, well cited publications) as well as first hand experience within the industry are the most qualified. Often, the most trusted are the most transparent about their credentials. + Does being a Chocolatier conflict with being a Chocolate Sommelier? You may ask "How can you talk in your workshops about quality and dark chocolate, and later make sweet confections and colourful bon bons?" For one, I'm not a purist. I understand the degrees of quality within chocolate, and although my values lean closer towards the purist, I'm also a realist. I don't believe it's somehow beneath me or hypocritical to enjoy chocolate others might consider lower quality. It's still food, and it still serves a purpose. To consider it garbage is to consider the work of the people who helped make it worthless, and their work in vain. I have the utmost appreciation for a higher percentage, dark chocolate bar made from quality beans, processed by a skilled chocolate maker, and contains an array of distinct, clear, and harmonious aromas. To me, there is no chocolate more wonderful and worth seeking. I also crave the world of craftsmanship. Since I was a child I worked with clay, wax, and wood to create all sorts of creatures. Chocolate is my medium to quench that desire in me. As well, my work as a chocolatier is often framed within my place of employment, and the expectations they have of the chocolate they wish to sell. Some I've worked for prefer the "purist" route, while others prefer the showy bright cute confections most people still seek. Perhaps one day I can have my own shop, and frame my creations within my expectations instead. However, I've learned that working within a conflict of ideas is what allows me to come closer to what satisfies me. 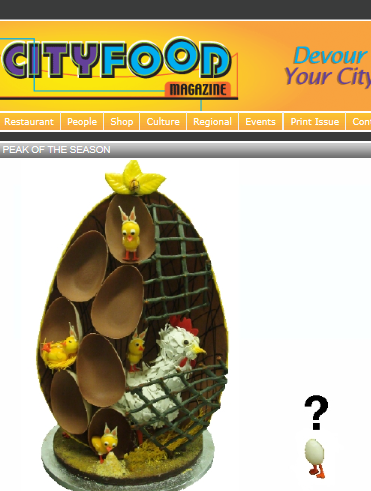 + Why do your workshops focus only on dark chocolate? Dark chocolate (containing cocoa bean and low amounts of sugar) allows you to appreciate the aromas that exist within the chocolate which originate from the cocoa bean and how it was processed. This is an area that most people either never experience, or don't have the tools necessary to experience it. Adding other ingredients such as milk, vanilla, or nuts, would distract from the purpose of many fine chocolate tastings. This is similar to drinking espresso to appreciate the coffee beans, or a spirit served neat. It allows you to taste the complex flavours without being distracted by additional ingredients. Now that's not to say milk chocolate or other chocolate is somehow beneath dark chocolate. You can have a milk chocolate tasting as well. However, my tastings often focus on appreciating your chocolate "neat." If you want to fully understand chocolate, you need to start with the fundamentals, the basics, and go from there, and dark chocolate allows you to do that. An artist learns to draw and shade before they paint, a musician learns chords and scales before playing a song, and in order to move forward with chocolate, you first need to learn how to taste dark chocolate! + Who are the workshops intended for? Everyone. This is a chocolate connoisseur workshop for anyone who wants to delve deeper into chocolate, or just understand it at a deeper level. It's also for those who want to be more confident in their choices, and be able to discern quality based on scientific studies and within current industry standards. 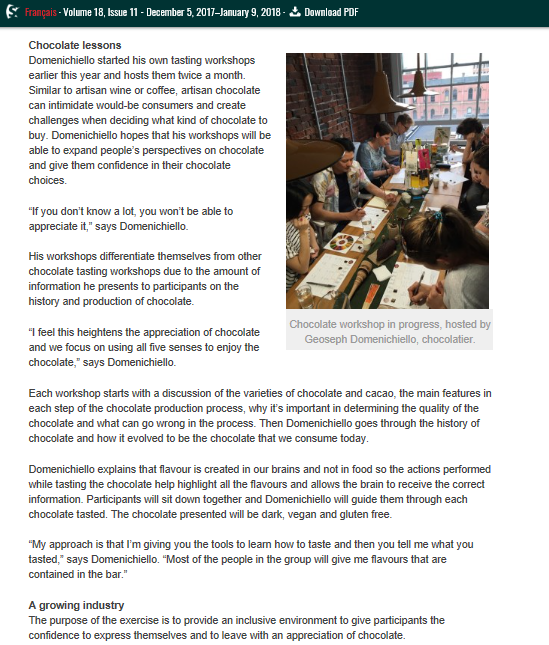 Although I developed these workshops to increase the level of knowledge for the consumer, the truth is, the level of information here on chocolate is often not found at most culinary institutions. It's a great workshop for those who want to work with chocolate, but haven't had any foundational knowledge from which to grow.